Educatey and 2 Sugars: Let's go [team name], let's go! When I was in high school, my mother and I had an understanding that if there was a sports day of some kind - cross country, swimming, athletics, whatever - that I could stay home. There was no point in me going to them, I wasn't going to take part, partially because of my complete lack of fitness/athletics ability, and partially because of my complete lack of team spirit. I never understood why every school (I went to a few) insisted on trying to make everyone do sports; it seemed a waste of time and it seemed as though it were catering to the select few of my peers who cared about that sort of thing. 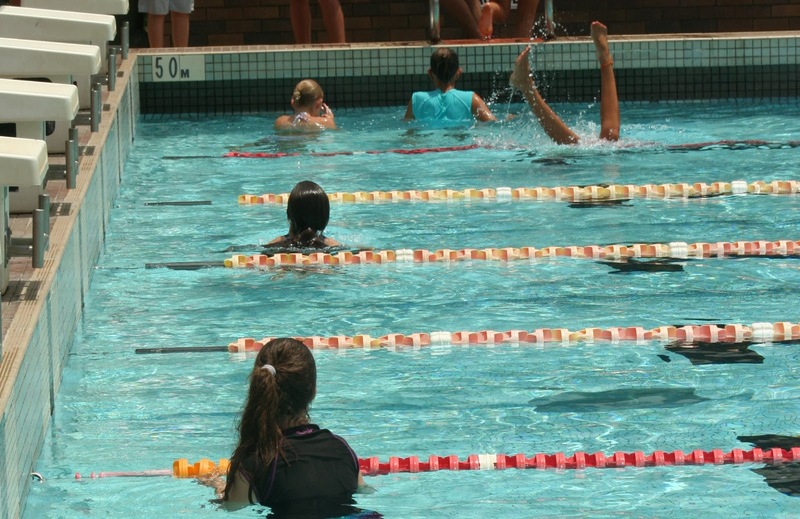 Our school recently had our swimming carnival, this was the first year out of 5 that I wasn't there because it was my day off, but I was a little disappointed. However, it did manage to remind me of the epiphany I had in my first teaching at this school, regarding sports carnivals. It was my first year, and I was standing around in the sun at the athletics carnival, overseeing standard long jump (we run double amounts of events, a 'championship' version for the serious contenders who are looking to complete at interschool or district levels, and a 'standard' event, which is generally a simpler version of the field event designed to get students involved to get easy points) and I looked around at the oval filled with jumping and throwing and running and I realised that most of the students were actually out on the field, not just sitting in the house tents. Other schools I've been to hadn't necessarily been able to boast high attendance numbers on their sport days, most will assume that many will be 'sick' and just get on with it. There were probably at least 80% of the students in attendance on both days (we run over two days...I haven't figured out why yet, but we do), and out of those, a majority were attempting to throw a vortex or jump past at least 1 marker to get points. At first I thought perhaps we'd hit on a great formula for fitness, maybe threatening students with consequences really can make them try things, and then a member of our house gave a war cry, and I responded. Some other students replied with their own, and it was a little silly and very spirited. That's when I realised what the point of the sports days really were: family. Our school attempts to create a sense of togetherness: all staff members are Christian, including the office staff and the groundsmen; we push for students to band together as a year level, to take care of younger grades, to respect and look up to older grades; I see students being cared for like they were a teacher's own children, like they were family. In the end, however, kids hate school, that's just how it is. It's boring, you have to do work, and the teachers are lame. At a sports carnival, it's school-related, but the things you're doing and the environment are all different. I see more students than I expect actually cheering on their friends, or even just random kids from their house; I see students trying to out war cry each other; I see students excitedly telling teachers about how they went in a race or event. This formula causes students to associate positive feelings with school, because even though it's not in the classroom doing 'work', it's still a school thing. It also helps to break down the boundaries between year levels (at least with the secondary cohort, we're a P-12 school, so there's still a bit of a divide between the Primary and Secondary cohorts). I get it now; it works. 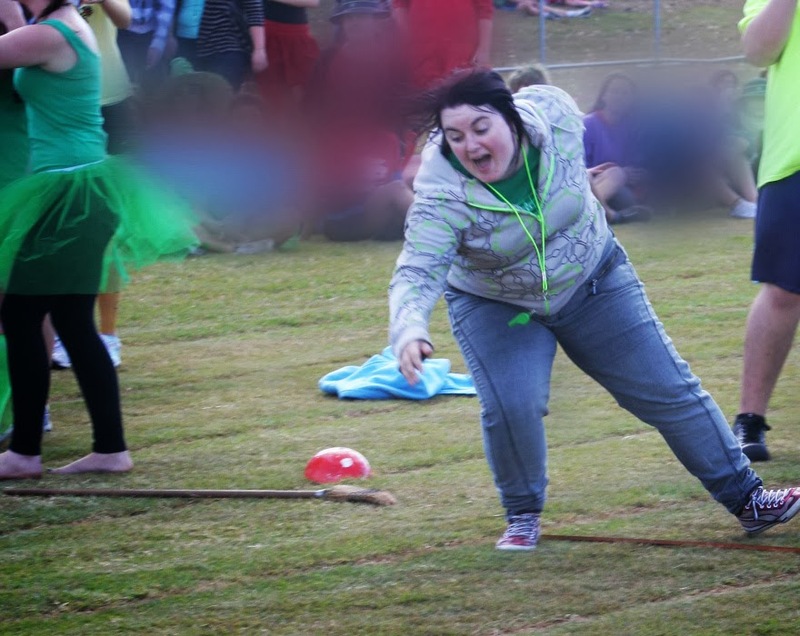 I think my mother would pinch herself to see her stay-at-home-watching-daytime-TV-instead-of-taking-part daughter cheering so loud she nearly lost her voice, before spinning in circles with a broomstick in a teacher novelty race at the end of the last day of the athletics carnival. 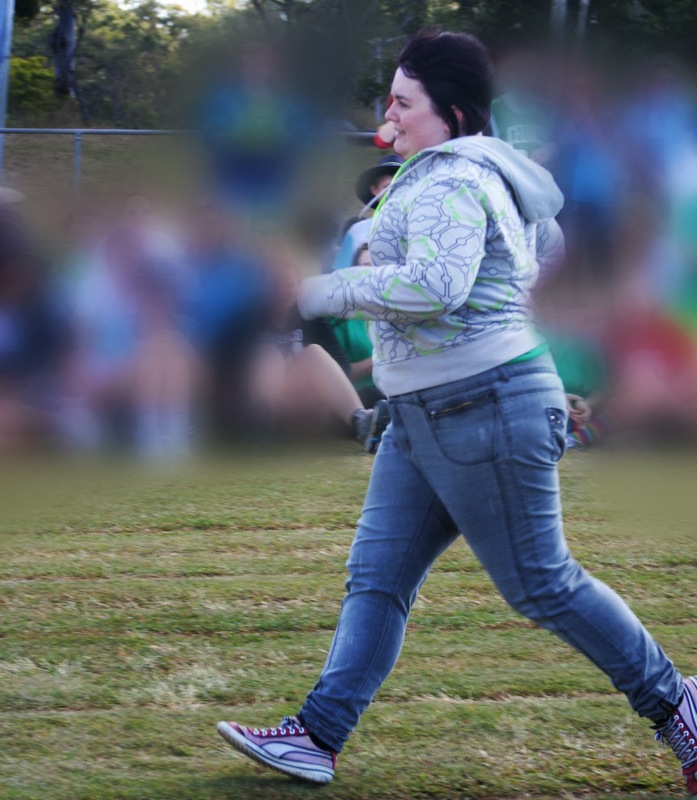 Woah, it's actually a picture of me running. This is basically a rare artefact. I'm certainly not going to show you the one of me from about 30 seconds earlier where I fell down from too much spinning.